One afternoon in December, the Arts of Korea Gallery at the Metropolitan Museum of Art was abuzz, as dignitaries from the South Korean government inspected the display, while members of the press watched. Then, Oh Seung-je, the director of the Korean Cultural Service of New York, and Daniel H. Weiss, the Met's president, ceremonially signed a pact establishing a long-term partnership between the Met and South Korea's Ministry of Culture, Sports and Tourism. Along with the agreement came a $1 million gift to the Met from South Korea. It will pay for enhancement of the gallery, loans from Korean museums, a major exhibition of Korean art in 2018, new research, and residencies at the Met for curators from the National Museum of Korea. It was far from the first time the South Korean government or its affiliates, in tandem with Korean corporations, had rained money on American museums to ensure that Korean art was seen here. The Met's Arts of Korea Gallery was created in 1998 with a gift from the Korea Foundation, an independent organization affiliated with South Korea's Ministry of Foreign Affairs. Other countries, including Italy, Japan and the Netherlands, promote their visual culture in the United States — sponsoring museum exhibitions, lending valuable artworks and so on. What is striking about South Korea is that it has systematically invested in building and maintaining permanent places to see Korean art at American museums, and in underwriting exhibitions that promote the country's ancient and contemporary art in the United States. "Since the American public only has rather limited opportunities to view and appreciate Korean artworks, concerted efforts are necessary to bring attention to the richness of Korea's culture and arts," Yoon Keum-jin, the executive vice president in the Korea Foundation's Washington office, wrote in an email. Since its founding 25 years ago, the Korea Foundation alone has midwifed the birth of permanent Korean art galleries at 18 American museums, including the Museum of Fine Arts, Houston; the Cleveland Museum of Art; the Seattle Art Museum; the Los Angeles County Museum of Art; and the Museum of Fine Arts, Boston. It has spent more than $9 million to construct these galleries, Ms. Yoon said. Without such funding, the museums say, many of these galleries would probably not exist. Reasons for this effort are both political and cultural. "The Koreans have a tradition of centralized planning and the government being involved in long-term economic planning and investment," said Timothy F. Rub, director of the Philadelphia Museum of Art, which received a grant from the Korea Foundation to upgrade its Korean gallery, along with other aid over the years. "They see the promulgation of culture as an instrument of economic policy." They also perceive a real need. "Many are aware of Korea through the rapid development of its technology and electronics sectors, but it is a country equally abundant in the cultural arts," said Mr. Oh of the Korean Culture Service. Historically, Mr. Rub added, Korea's culture has been overshadowed. "Look at the collections in the United States of East Asian art. Japan and China are far more prominent than Korea." Yet, he said, "look at the history of Korean art; it was very much prized by the Japanese and the Chinese." For museums in the Korean fold, the support can be steady. Soon after the Houston museum received $470,000 to build its gallery, the Korea Foundation provided $30,000 for programming. 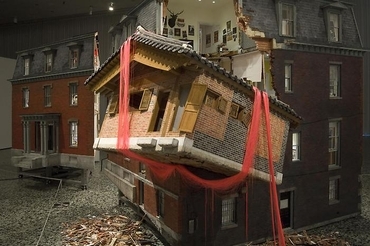 In 2010 it gave the museum $150,000 to organize and present "Your Bright Future: 12 Contemporary Artists From Korea," the first major American museum exhibition of contemporary Korean art in years. Since then, the Korea Foundation has donated more money for programming of Korean art. The Los Angeles County Museum of Art, which was a co-organizer of "Your Bright Future," also received money from the Korea Foundation for the show, which was sponsored by a Korean container company. The Koreans have also proved receptive to American ideas. Some years ago, Mr. Rub approached the National Museum of Korea with the notion of showcasing the art of the Joseon dynasty, which ruled Korea from 1392 to 1910. That turned into a cultural exchange that included the Museum of Fine Arts, Houston, and the Los Angeles County Museum of Art. They each presented the Korean exhibition and sent an exhibition of American art to South Korea. South Korea also supported a series of workshops between 1999 and 2013. The Korea Foundation hosted curators from 26 countries, who traveled to South Korea to hear art experts, take field trips to cultural sites and learn technical information about Korean art and its proper display. Despite the current economic uncertainties that have prompted many governments to cut their funding of the arts, Mr. Oh said that South Korea would continue its overseas largess. "I believe that economic prosperity and cultural wealth go hand in hand," he said in an email. "This is why it is important to even further promote the cultural arts during times of economic slowdown." What's more, he added, South Korea's president, Park Geun-hye, has made cultural enrichment one of her major priorities.